The February 21, 2011 issue of the Seattle Times included on page B1 a picture of the Dock-Side Cradle and one of Aurora Quality Buildings (AQB) mini-cabins. 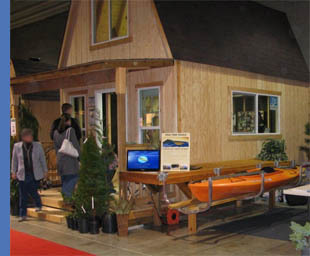 The picture was taken at the 2011 Seattle Home Show. The accompanying article stated that the downturn in the economy had forced people to look for affordable ways “to add an office, storage space or mother-in-law unit”. AQB also specializes in garages and vacation homes and has now added the Dock-Side Cradle to its line of products.